We had the Super Eight World Boxing Classic Tournament in the summer of 2012 to crown our first World Boxing Elite Lightweight Champion. The first 8 boxers to win their first fight earned one of 8 open spots in the tournament. - Competition started with a group stage where each boxer fought three times. - Boxers were awarded Three points for a win by KO, Two points for a win by points, 1 point for a draw and 0 for a loss. and the No.2 against the No.3, The winners of the semifinals proceeded to the tournament finals. 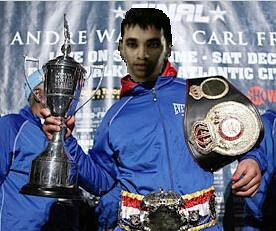 "guts" to go after the win by knocking this "bad *"
...WBE LIGHTWEIGHT CHAMPION OF THE WORLD....ANTKNEE P.